Home › Chemistry › Is CaBr2 an acid or base or neutral ? 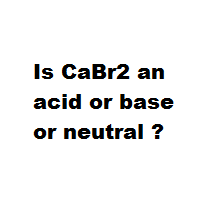 Question : Is CaBr2 an acid or base or neutral ? Question : Is CaBr2 ( Calcium bromide ) an acid or base or neutral ?